Obviously, one of the blades is a Sharpfinger-Old Timer, but the sheath is mine. This is totally sufficient and compatible with MOLLE or a similar platform. Also, placing it under the waist belt makes for a secure ride-high and concealed. I have worked with Kydex and found that PVC is as easy to work with. The pictured blades are reciprocating saw blades, once upon a time. So they are free after they are dulled, or they can be had new for about $3 to $7 bucks. 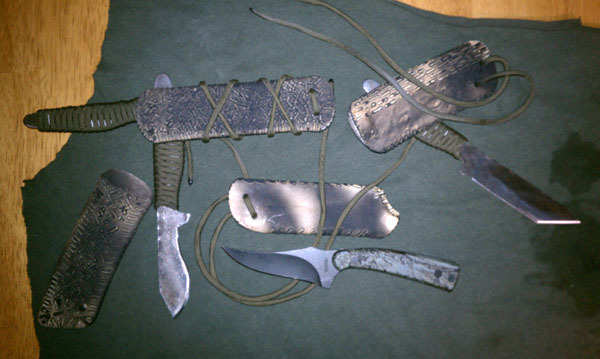 They are suited to make fine fixed blade-full tang blades. The one limitation is blade length. They really need to stay at or under 4" if ergonomics, functionality and strength are to be retained. A note about the steel... It is high carbon, heat treated with a Rockwell hardness in the low 50's. Sound familiar? Yep, same steel or similar as to what is in the high dollar blades... If you can find them! The metal is a tad softer due in part to the abuse they are made for. These are already heat treated, so while working them, it is critical to not let them get hot. Dunk them in a cup of water often during the sanding and grinding. Does not apply if you use primitive tools. This cold process will maintain the steels temper. Happy scrounging!